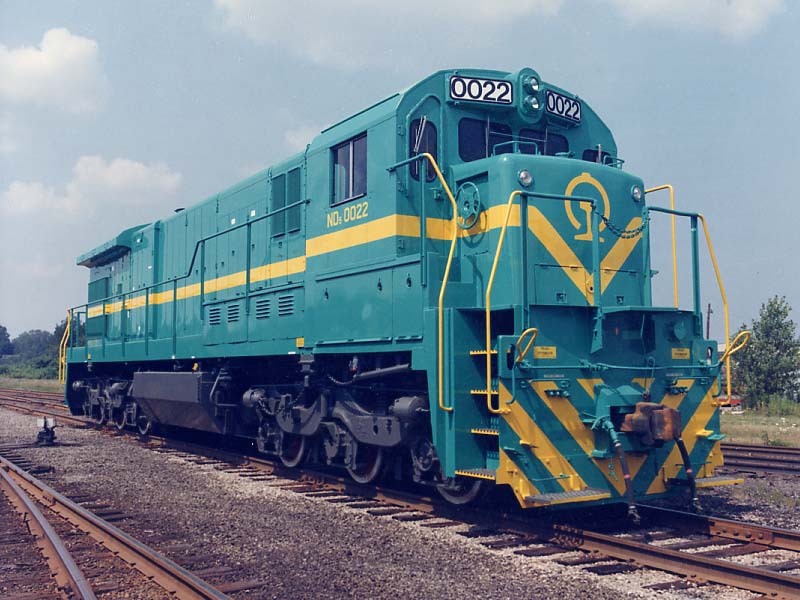 ND5-0022 is one of the first batch of C36-7's (with standard cab windows), although classified at C36-7 the order for China was rated at 4000hp. Photo supplied by GE. 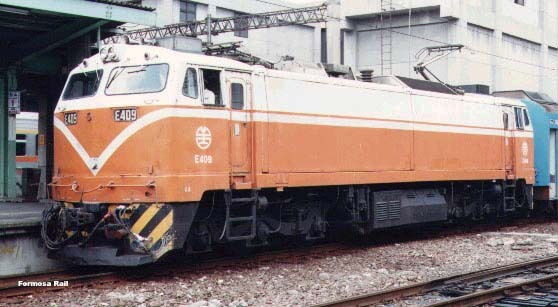 ND5-0305 is one of the second batch of C36-7's (with the much larger cab windows), although classified at C36-7 the order for China was rated at 4000hp. Photo supplied by GE. 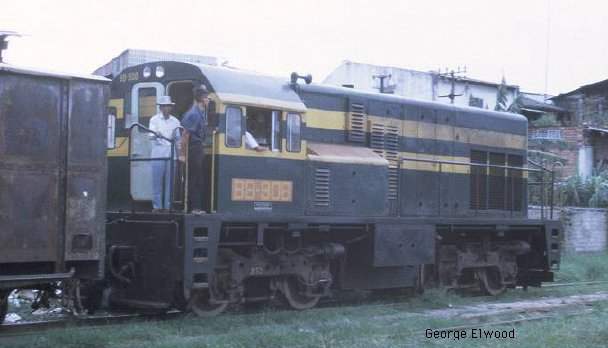 2305, one of thirty C18-7i Locos, used on passenger trains. The class work on El Qahira (Cairo) to El Wasta stoppers south along the main line towards Luxor; El Qahira to Bur Sa'id expresses, El Qahira to Alexandria and through to Mersa Matruh, usually expresses only. 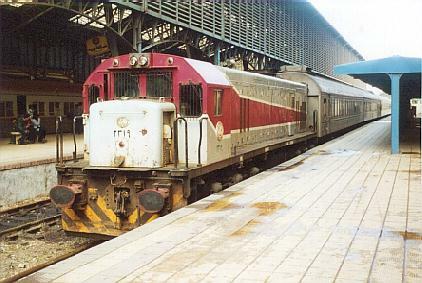 2303 waits in middle track at Cairo Ramses station in November 2003 with carriages for a train to Itay El Beroud. Fitted with 8 cylinder FDL engine of 1800 hp. 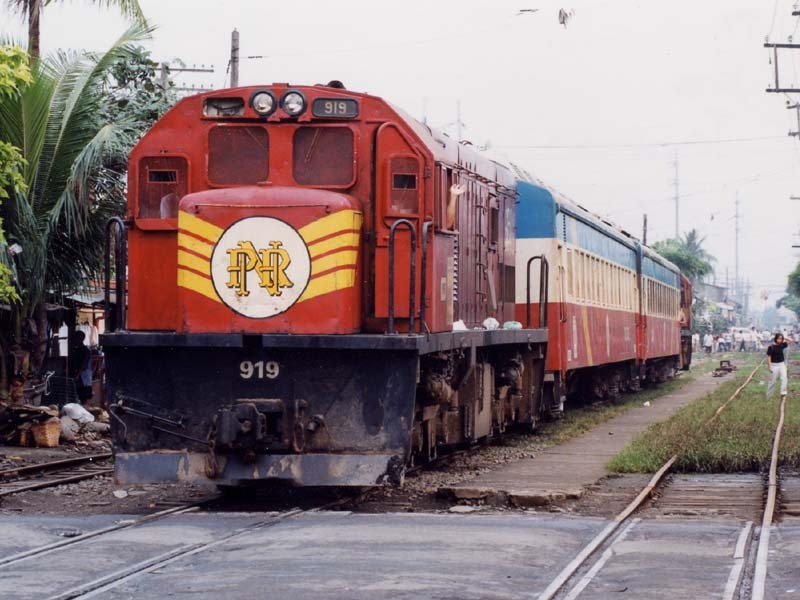 CC200.26 in an old livery. 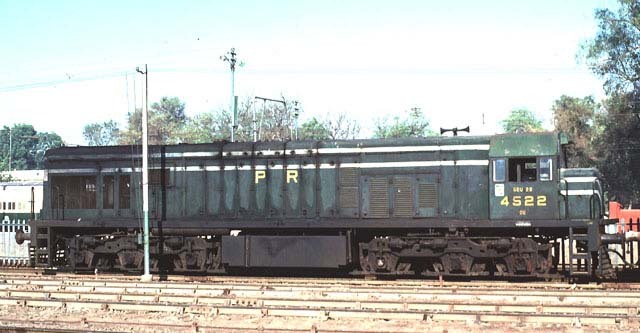 Loco was 1800hp gross power, weight in working order 96 tons (Co)'(2)'(Co)' axle arrangements to keep the axle loading within the maximum axle loading limits imposed then (12 tons). Bambang Tjondrodiputro collection. 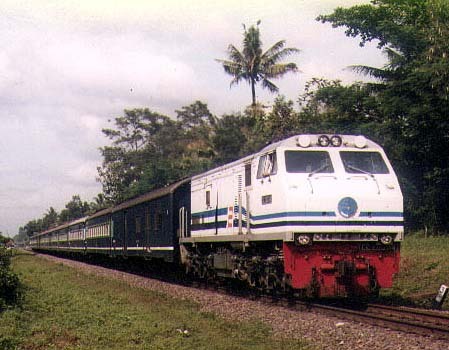 All have been retired, but three can be found in Cirebon. CC20158 seen on a passenger train. Photos by B. Immanuel Yahya. 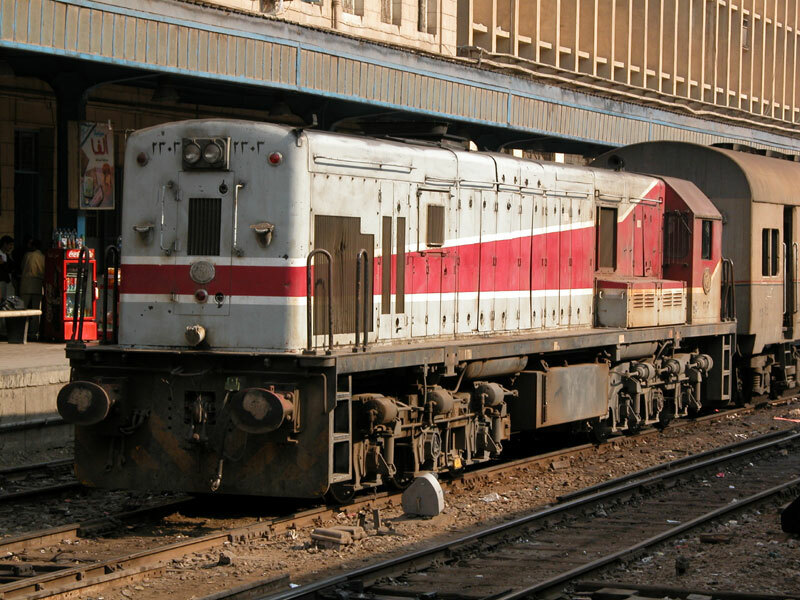 A total of 62 Locos were supplied in two batches. 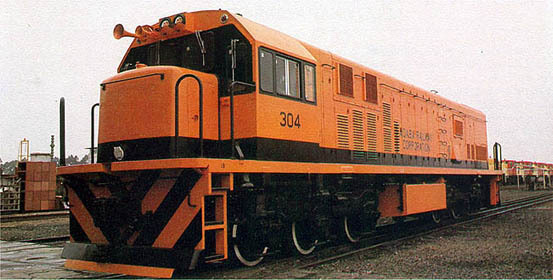 33 U30C's were built 1992-3, a follow up order was completed the next year, being for 29 model C30-7i's. 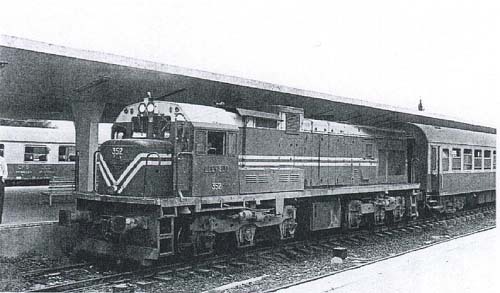 The Locos were later modified with larger radiators, therefore gaining the "winged" radiator appearance. Photo by GE. Freshly overhauled C30-7i no. 2068, as above the Loco is seen with the modified larger radiators, therefore gaining the "winged" radiator appearance. 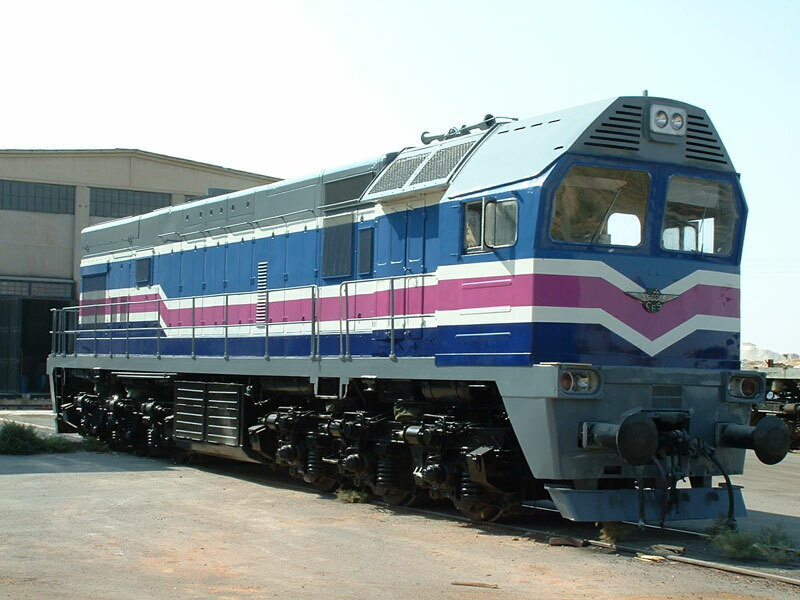 A Brazilian-built U20C supplied to Aqaba Railway Corporation, Jordan. Phosphate trains run over the 283 km line from El-Abiad to Aqaba. 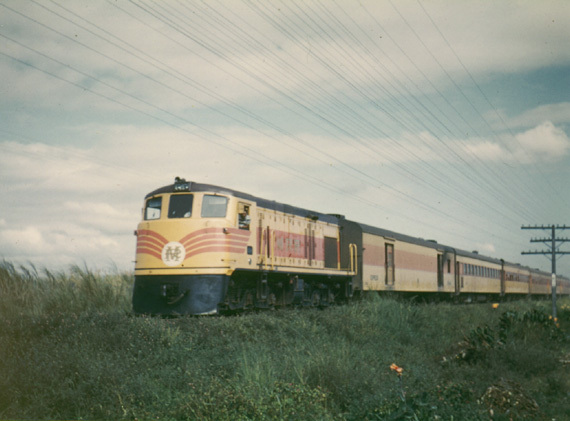 Eighteen metre gauge locos were delivered in 1980. The copy of this photo, originally published in a G.E. catalog, is courtesy of Hermes Yoiti Hinuy, from São Paulo SP. 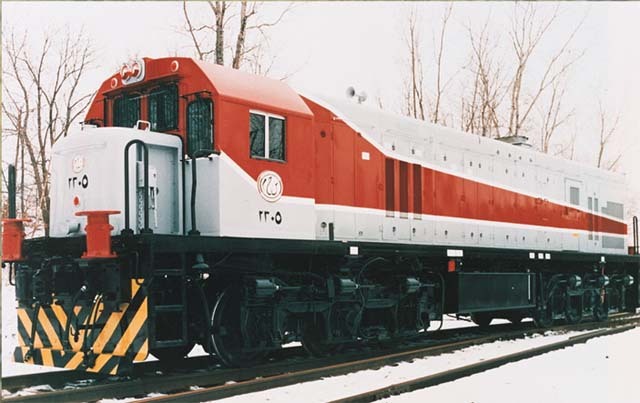 During 1995 GE undertook rebuilding of Kazakhstan TE10M-0736 twin unit Loco. 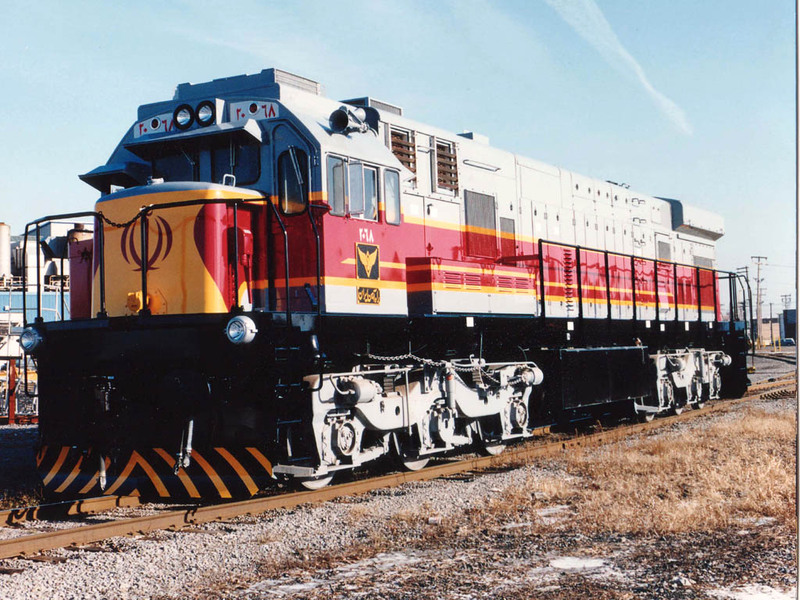 Further rebuilds were carried out locally, twenty units were planned for Kazakhstan and twelve for the Almaty Railway. The ten cylinder Kharkov opposed piston engine being replaced by a V12-7FDL engine. However not all were completed due to financial difficulties. 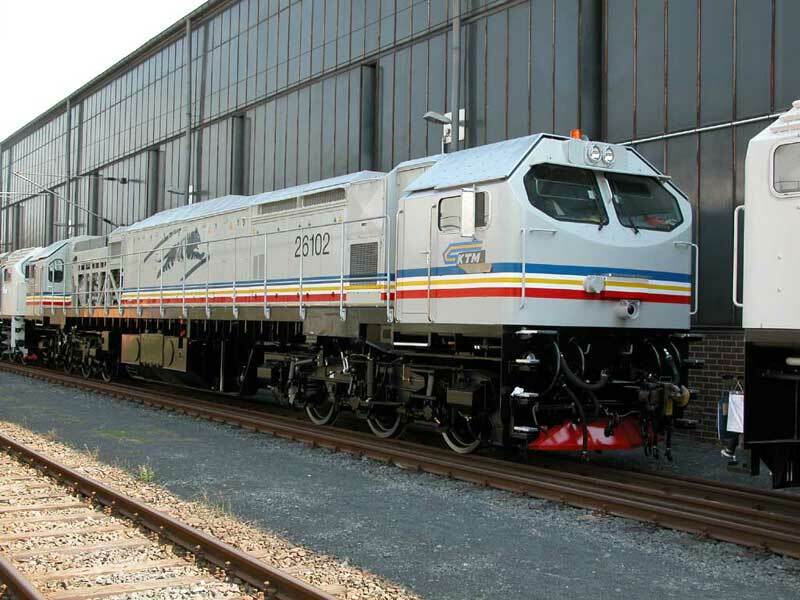 Brand new DE33AC "Blue Tiger" 26102 is seen at the Bombardier works in Kassel (Germany) in August 2003 undergoing final testing before being moved by road to Hamburg for shipment to Malaysia. Fitted with 12 cylinder FDL engine of 3200 hp. 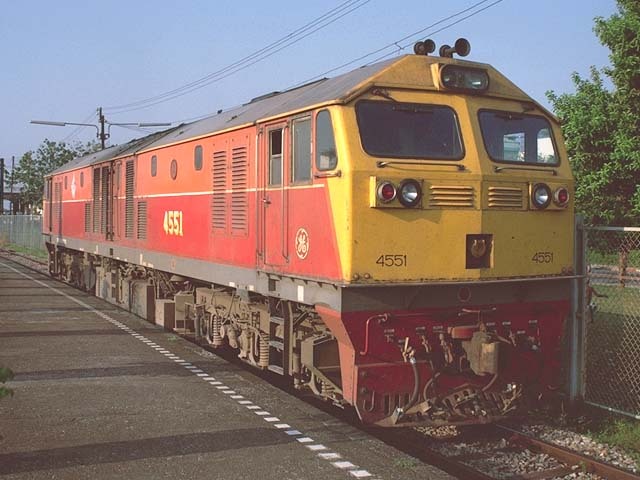 Two C30-7i's were supplied in 1996. 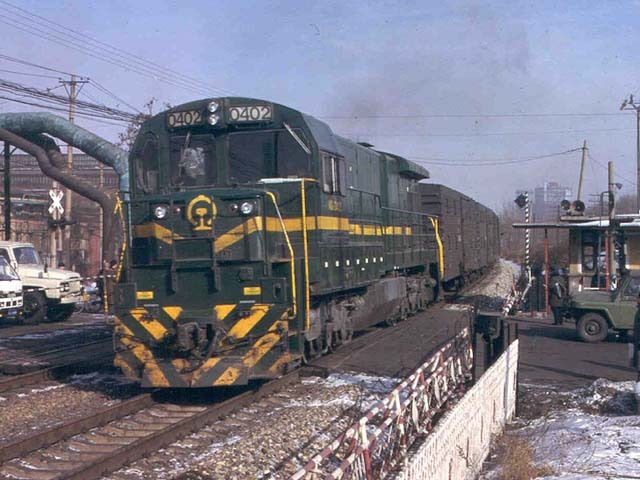 They are employed in hauling coal trains from Ulan Bator. When purchased it was not intended that they would be used for this service. 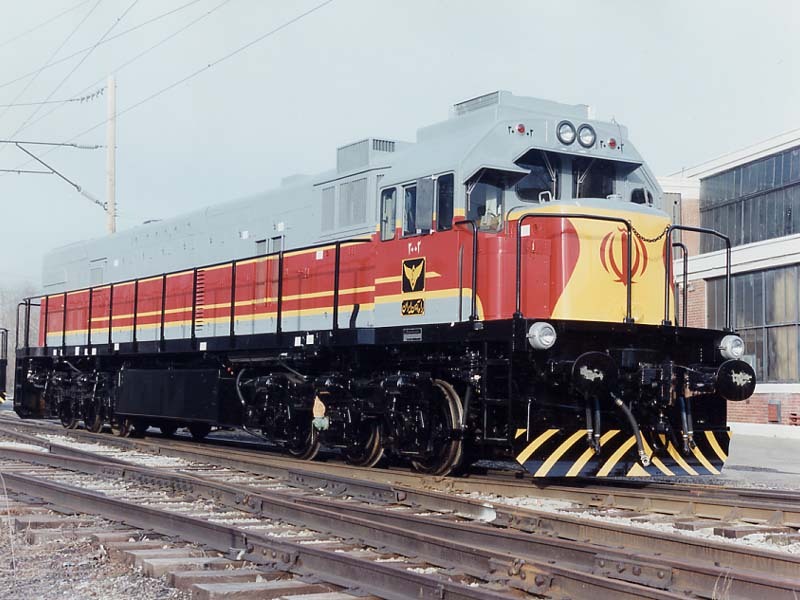 4522, one of 42 U20C's built for Pakistan by GE (Eire) from 9/70-3/71. Builders numbers 37324-37365, rated at 2150hp, fitted with the 7FDL V12 engine. 1.676m gauge Co-Co's. 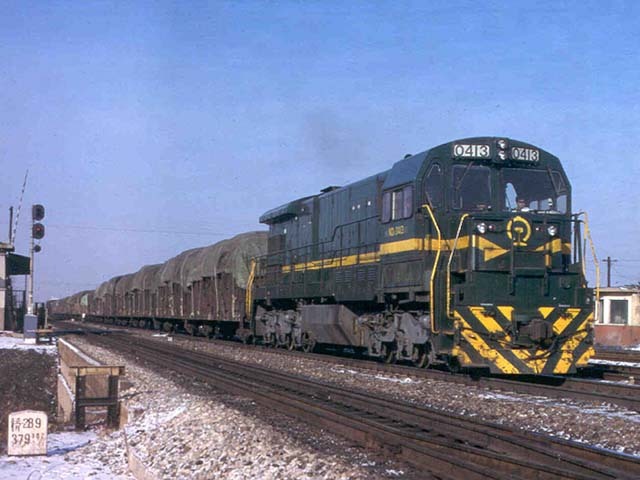 Seen at Multan Cant on 1 January 1981 photo by Ray Graf. 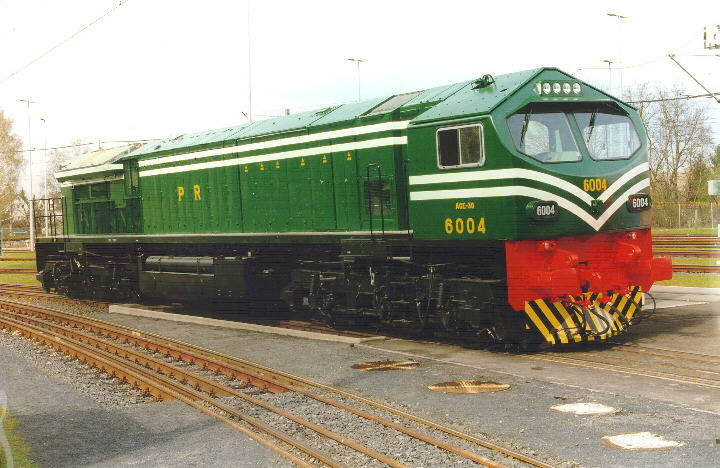 Pakistan 6004 seen at the ADtranz factory in Germany, prior to shipment. First 10 Locos being built and shipped. Remainder were either assembled or built in Pakistan. Fitted with FDL-16 engine, of 3300hp. Unlike "Blue Tiger" prototype that was FDL-12 engine. 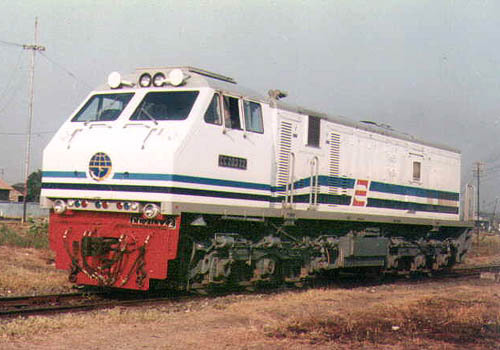 GE Lokindo (Indonesian built) U20C, built for International Container Terminal in the Philippines. 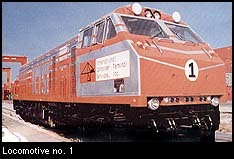 The Loco was delivered in March 1997. Used on freight traffic to its inland container terminal. 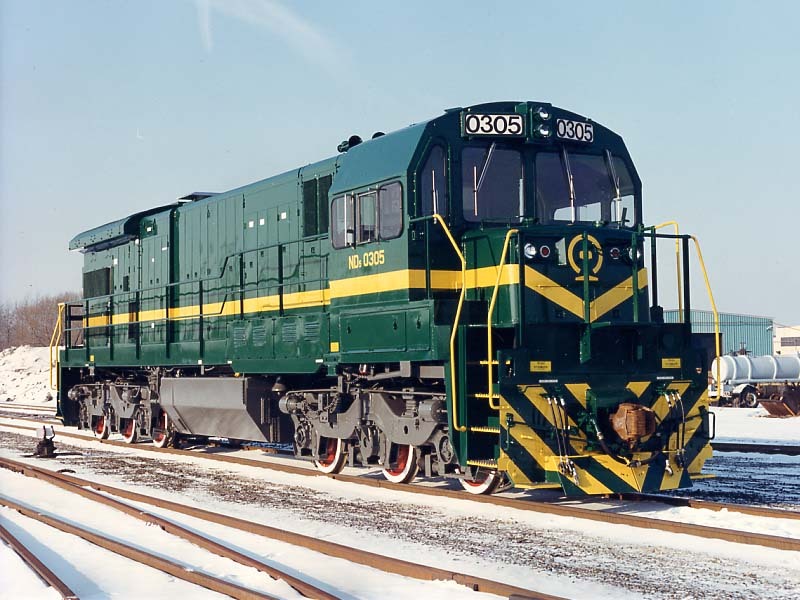 A half section of a 2TE10M loco is seen at GE factory in Erie, USA after full rebuild and upgrade program. Now fitted with 12 cylinder FDL engine in 3200 hp. Loco has since returned to Russia. GE photo. 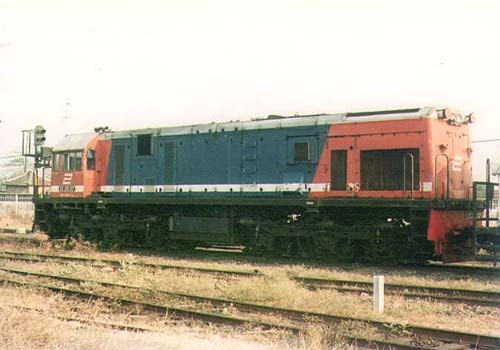 Thirty U17C's work on CFS but numbered in two batches (301 and 351 classes). 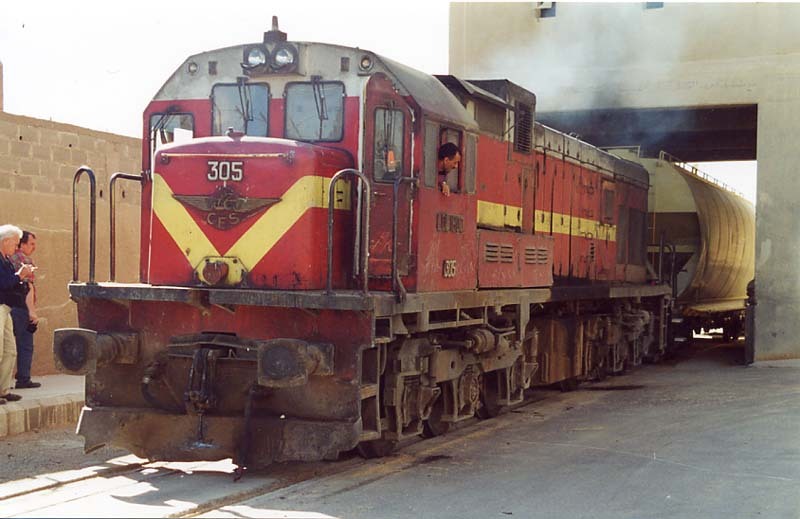 309 is seen at Homs on a passenger train to Tartus, October 1983. 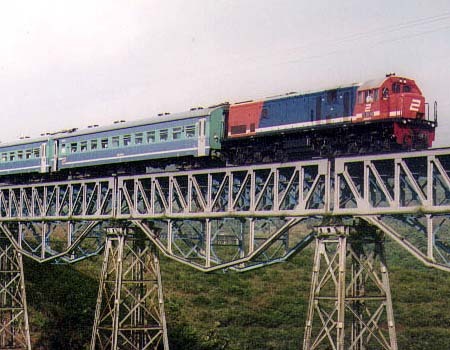 Locos built in 1974. Photo in Fern Express magazine issue 1/89. Thirty U17C's work on CFS but numbered in two batches (301 and 351 classes, one batch intended for freight, another for passenger). 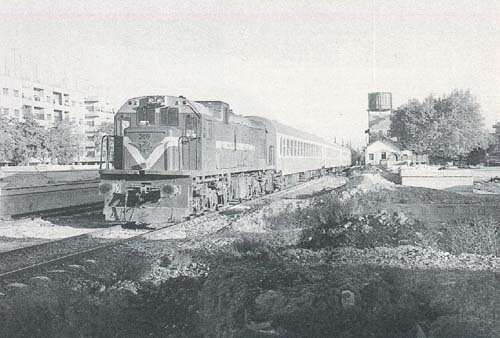 352 is seen at Damascus on a passenger train. Built in 1974. 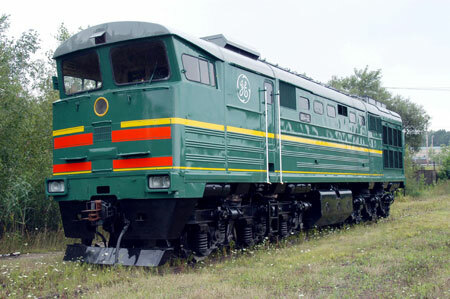 A Russian built TE14 having just been re-engined and rebuilt by GE. Now having a 12 cylinder FDL engine of about 3000 hp. 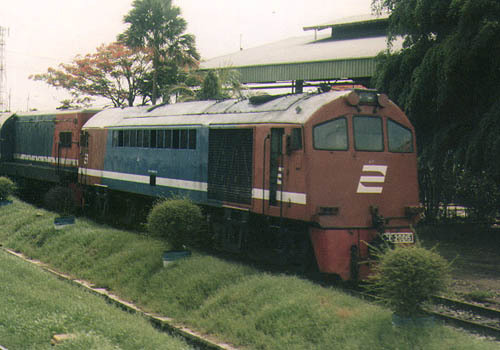 One of 20 locos modified from 2003. GE photo. 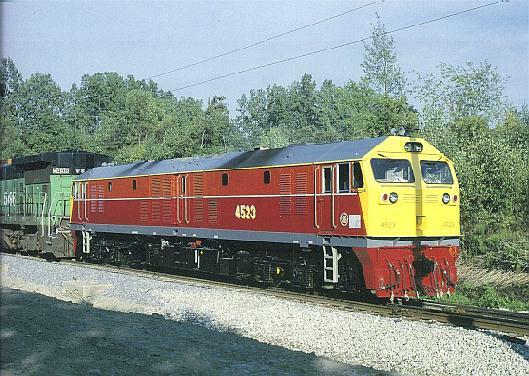 Thirty nine E300's were built during 1978-79, they are for general purpose use, and are not fitted with the necessary auxiliary equipment for working air-conditioned passenger trains. Like the E200's and E400's they are rated at 2800kW, and Co-Co wheel arrangement, 110km/h max speed. 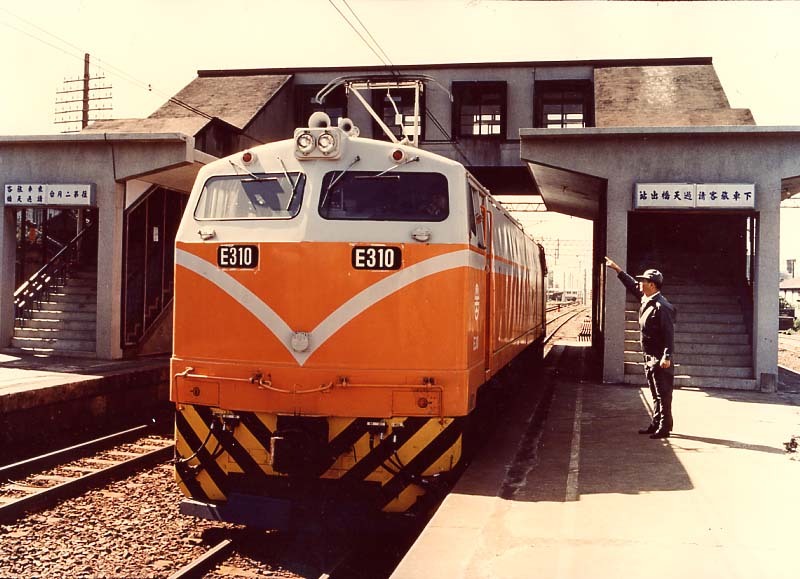 The eighteen E400 are very similar to the earlier E200 and E300's, built in 1980 and 1982. 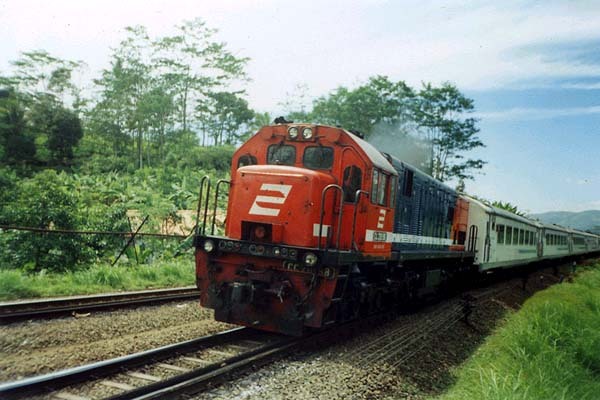 They can work air-conditioned trains, and have a higher gear-ratio for faster top speed (130km/h). The official Taiwan site. 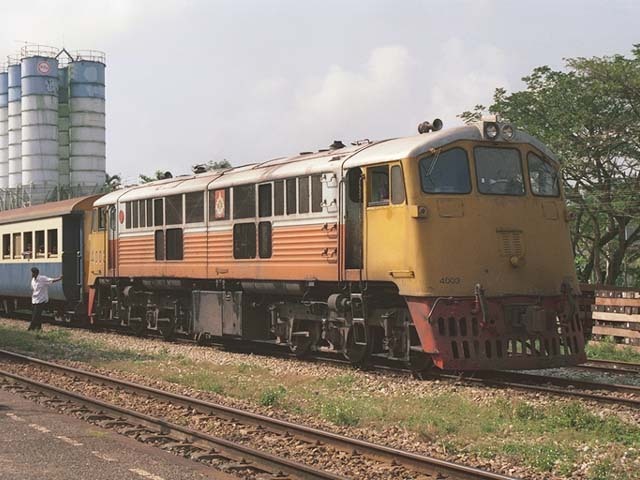 4003 is north of Hat Yai Junction on a local stopping train 456 from Yala to the east coast town of Na Khon Si Thammarat. 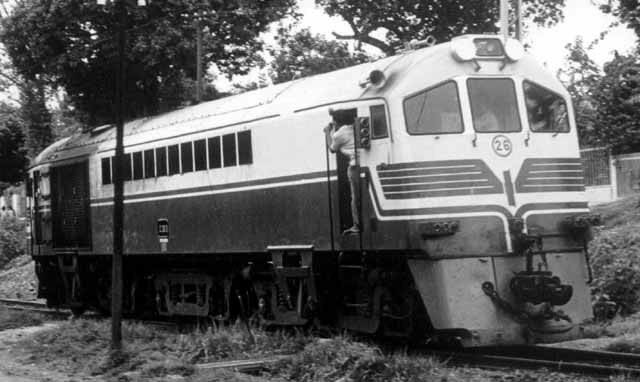 A small Krupp B-B Hydraulic had worked to Hat Yai Junction, where the “Shovel Nose” took over for the run north on the main line towards to Bangkok. Fitted with twin Cummins engine, they make a quite loud interesting sound. Classified as UM12C, built 1963-66. Recording on Mark's Sounds. 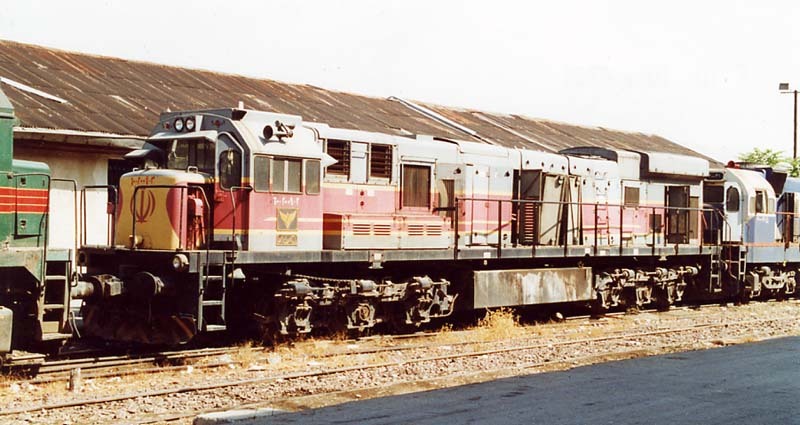 4523 C22-7I is seen on test in the USA, August 1995, coupled to ex ex BN B32-8 in dynamic brake mode for load tests. Note the Locos are both on different gauges, and compare size of Locos. Photo by Mark Hoppe, in X2200 magazine. 4551 is at Hat Yai Junction, about to take over a busy northbound express for the long run north to Bangkok. 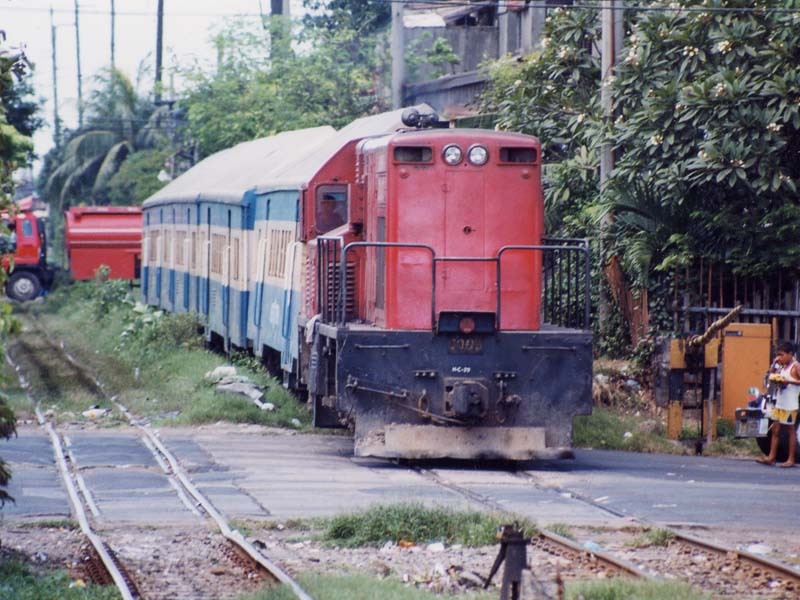 Fitted with twin Cummins engine, and large exhaust silences, these are not particularly inspiring Locos. 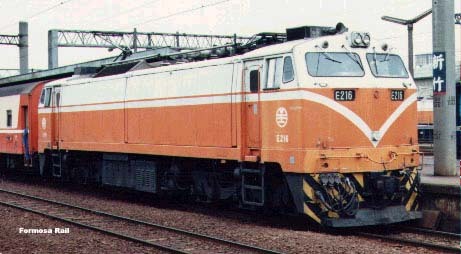 Classified as CM22-7i, built by GE in 1995. 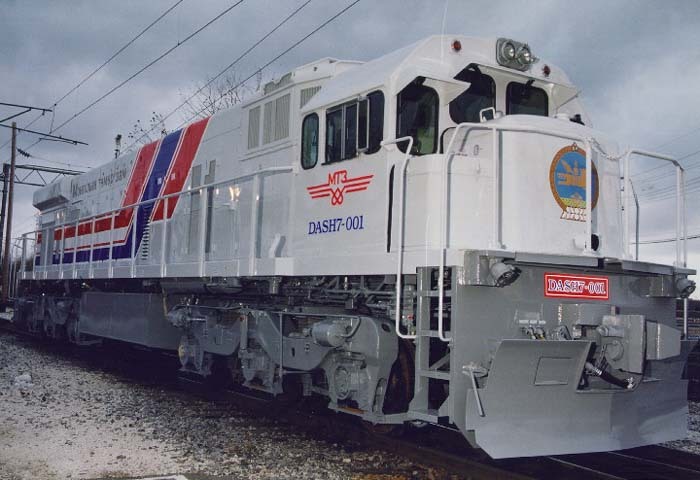 DE20002, one of the five U18C's built for TCDD in 157. 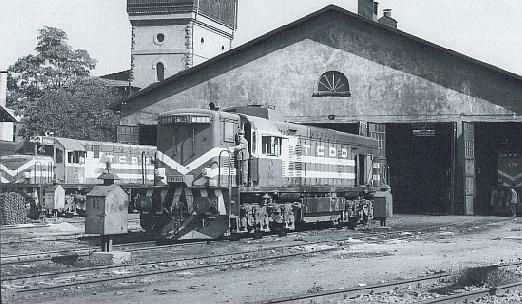 Seen on Ankara shed in 1969. All Loco's are now withdrawn. 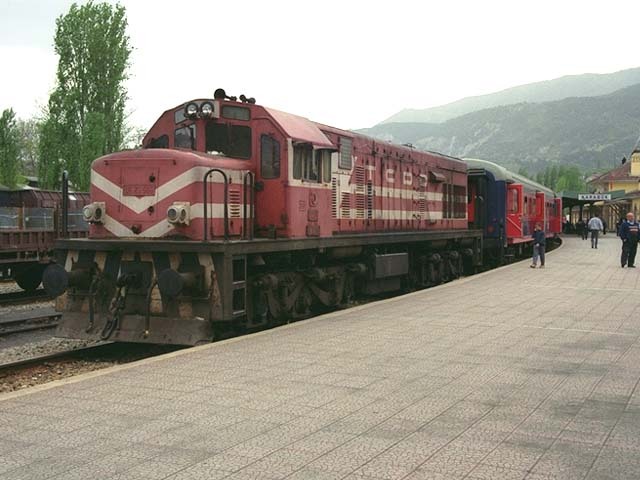 DE21506 at Karabük. 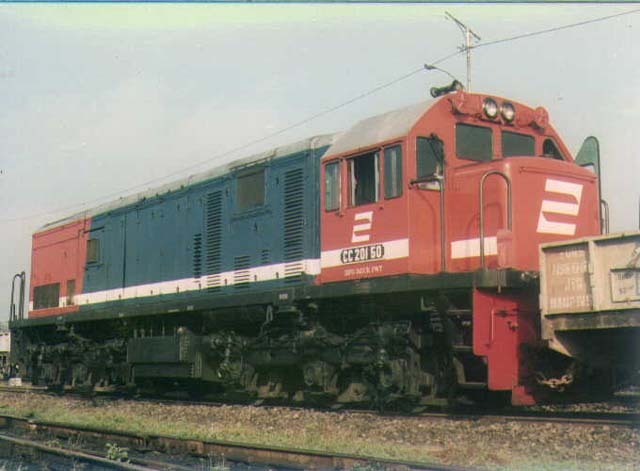 Eleven of the original forty General Electric built U20C's remain in use, based at Catalağzi. (21501/4-6/1617/19/20/21/27/34). 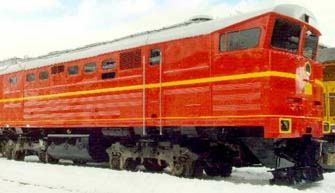 They are mostly used on freight duties, may see occasional use on local passenger, though doubtful as stock needs electric heating from DE24000's. BB-908, one of 23 U8B's built in 1963.